← Why Is Important Green Space at Craighouse Dropped from Nature Designation when Buildings and Carparks across City Covered? In light of the Council trying to de-designate large sections of the site in the New Local Plan , one of our members, Tana Collins, has been researching an important protected animal at Craighouse that is protected in the UK and also under European law, with severe penalties for those that kill or destroy their habitats. As many people know, Craighouse is full of bats. They may look a bit like winged mice, but are very different with a maximum recorded lifespan for Pipistrelles of 16 years and just one young per year – which is why they can be so vulnerable to change. 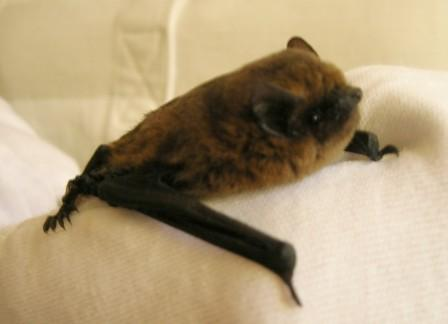 Pipistrelle populations have reduced by approx 70% over 15 years. According to the wildlife audits there are two kinds on the site the Pipistrelle 45 and 55. If you walk on the orchard at dusk, you will see them feeding on the insects around the fruit trees. They are all around the woodland fringe and across the open spaces. Craighouse contains a perfect mosaic of habitats for a wide range of animals – and is perfect for bats due to its unique combination of open space, old buildings, woodland and nearby water (at Craiglockhart Pond). This combination is absolutely perfect for bats. The website says that Pipistrelle numbers have dropped by about 70% during the 15 year period 1978-1993. All the bat species in Scotland are protected. Why is the Orchard/Lawn not covered by the Biodiversity designation? The DEFRA website specifically lists woodland edges and parkland/amenity grassland and recreational areas as important habitats for the two protected bat species known to be on the Craighouse site. According to DEFRA, orchards also provide additional feeding opportunities for species that feed in semi open habitats such as woodland edges and glades. As well as woodland being important to bats, Pipistrelles are bats that use grasslands extensively. You can easily see this with the naked eye up at Craighouse where bats fly across the orchard/lawn feeding on insects. So, it is clear that all the parkland orchard/lawn area should be protected. So why is it not? Indeed, why has a large section been removed from the Biodiversity designation? The Council are claiming the decision was made by wildlife experts. But there is no evidence of how or when any assessment was made. Nor of any meeting where such a decision might have been discussed. The Friends of Craighouse would like to know how any wildlife expert could de-designate areas known to be key habitats for bats as listed above on a site that is well-known to be used by populations of bats? We would like to be provided by the Council with evidence of this assessment and the decision-making process undertaken and the data they were provided with to undertake such an assessment. So far, we have received no answers to our questions. Why have all the green open spaces where the Craighouse Partnership want to build around, in the vicinity or across from the listed buildings been de-designated? Pipistrelles are known to summer roost in old buildings and feed on grasslands And yet all the green areas surrounding the buildings have also had their designation dropped in the proposed New Local Plan. Again, the Friends of Craighouse want to know – how was this decision made, what assessment was undertaken and how was the criteria applied? There appears to be no justification for this whatsoever. Why have the old buildings on Craighouse been dropped when modern buildings like the entrance building to the Botanics or large chunks of Waverley station been included? It says that Pipistrelles summer roost in buildings. Old buildings are particularly important for bats. This is one of the reasons that many older buildings may be included under Biodiversity site designations. The buildings were all previously covered by a nature conservation designation – but now in the proposed new local plan – again – they have been quietly dropped. So why have all the buildings at Craighouse – known and evidenced to be surrounded by feeding bats – had the designations quietly dropped in the face of direct evidence that they should not be? Why have the old buildings at Craighouse been deliberately removed from the designation when buildings such as the modern entrance building for the Botanics which is too new to have established bat populations, are covered? All bats are now protected by law. It is illegal to intentionally kill bats, to disturb them or to damage their roost sites. Bats are extremely highly protected. All bat species found in Scotland are classed as European protected species and are fully protected under the Conservation (Natural Habitats, &c.) Regulations 1994 (as amended). keep, transport, sell or exchange or offer for sale or exchange any wild bat or any part or derivative of one (if obtained after 10 June 1994). DEFRA write that several basic management principles are relevant to the management of habitat for bats including avoiding the loss of suitable habitat – this has a direct effect on the number of bats that can survive in an area and is an important factor in the recent decline of some bat populations. In light of all this, how come the Council made the decision to remove large areas of the Craighouse site from the Biodiversity designation and not to apply this designation to the known feeding grounds of key protected species like bats? What evidence or assessment was done to come to this decision? How can we trust any decision going forward on this if they won’t give us answers, or be properly transparent? Thanks go to Tana Collins for researching this topic and we are always grateful to anyone sending in any information and further research. We also have a section Our Craighouse on the menubar for people’s stories and photos.